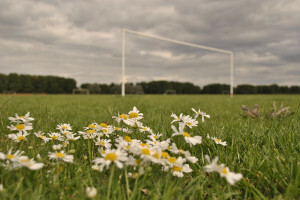 Wandsworth Council has given approval to sell off playing fields at Elliott School, despite a 57,000 signature petition. The school is at the centre of a number of recent education-based scandals: it was due to be refurbished under the Building Schools for the Future programme, but lost funding when Michael Gove pulled the scheme. Selling off the playing fields and part of the school building is thought to be the only way to raise money for badly-needed repairs and new facilities. Elliott School is also one of the five instances where government advisers recommended not selling playing fields, but Education Minister Gove overruled them. There has been a huge campaign against the sell-off in Wandsworth, which will see the school lose tennis courts, a nature garden built by students, outside theatre, playground, tree memorialising a pupil who died on the site and football pitches* – ironic, given that Olympic footballer Fara Williams is a former pupil. The refurb will create new sports facilities, and pupils will continue using local playing fields run by Roehampton University. Netley School in Camden is also losing its playing fields, again after ministers overruled advisers. In this case, the leader of Camden Council made a special appeal to be allowed to sell. Other London schools that have had playing field sales approved are Dunningford School in Havering and Kingsbury School in Brent. The Telegraph says Barnet Council have also applied to sell school land. Update: Wandsworth Council have been in touch to correct us on what is actually been sold off. We got the information above from the campaign to save stop the sale and it seems the plans have been updated. We are actually now only proposing to sell the staff car park, the former caretaker's house, one disused tennis court, two tarmac areas and a sloping piece of grass not suitable for sport. None of the space being sold is used by the school for sport and can't really be described as 'playing fields'. The funding generated will allow the school to create new sports facilities that will enable competitive sport on the site for the first time as well as badly-needed work on the main buildings. We've asked whether these facilities would have been refurbished had BSF funding gone through, and where the new facilities will be sited, but as yet haven't had a response.